Coos Bay and North Bend are located along the sheltered waters of Coos Bay, where the Coos River enters the Pacific Ocean. Just south, you'll find Charleston, an active fishing town. The area is rich in maritime and forestry traditions, and a popular getaway destination. State parks occupy the bulk of the ocean coastline, both north and south of the bay. A handful of streams and rivers empty into Coos Bay, and a number of freshwater lakes dot the area. While Coos Bay and North Bend are 40 miles south of the officially-designated Oregon Dune National Recreation Area, Oregon's sand dunes continue down and cover much of the spit protecting Coos Bay. All of this water, sand, and beach provides the opportunity to spend time in glorious nature, whether wildlife watching, hiking, beach combing, or kayaking. Both Coos Bay and North Bend have charming shops and art galleries and lovely city parks. This Oregon State Park preserves the former estate of Oregon timber baron Louis Simpson, combining historic structures, manicured gardens, natural areas, and ocean views into one must-see attraction. During your visit, you'll be able to stroll through acres of garden spaces, including several rose gardens, a Japanese-style garden, a garden pavilion, and a greenhouse. 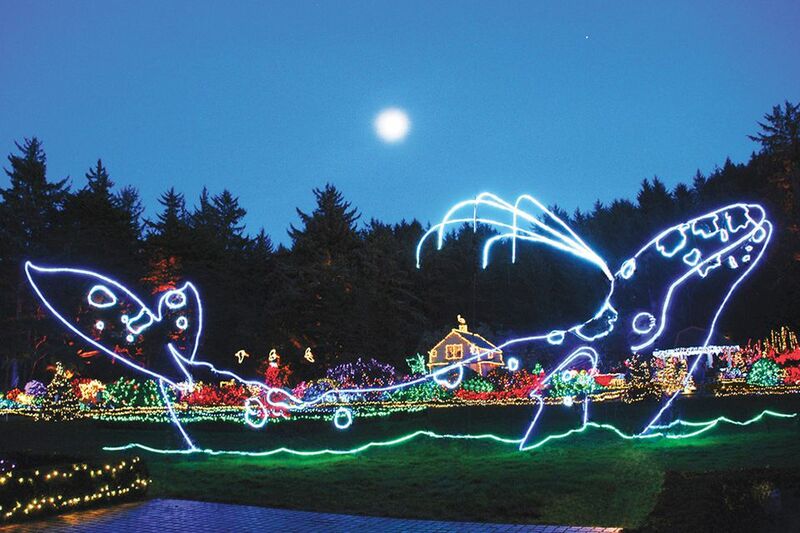 These gardens are transformed into a wonderland of colorful lights during the Christmas holiday season. Shore Acres State Park's hiking trails take you to stunning ocean viewpoints, where you can watch waves crash against the sandstone bluffs or enjoy whale watching in season. You can also hike down to a beach cove where you can wander and explore. South of Coos Bay and off Highway 101, Cape Arago State Park has awesome rocky beaches perfect for hiking, beach combing, wildlife watching, wandering, and exploring. The north side of the cape provides views of Shell Island, a National Wildlife Refuge that is home to seabirds, sea lions and seals. Cape Arago's South Cove has a nice stretch of sandy beach and a fine selection of tide pools. Occupying a historic former post office, the Coos Art Museum exhibits contemporary American art and fine crafts. Local and regional artists and themes are often featured, with major maritime painting exhibitions occurring on a regular basis. In addition to the art exhibits, an entire gallery of the museum is devoted to Steve Prefontaine, the famous track star from Coos Bay. While the Cape Arago Lighthouse is not open to the public, the charming lighthouse can be viewed and photographed from a number of area locations, including a viewpoint along the Cape Arago Highway. Located along Highway 101, The Mill Casino in North Bend offers gambling, entertainment, and dining as well as a waterfront hotel and an RV park. Your gaming options include slot machines and table games like blackjack and roulette. The on-site nightclub serves as a sports bar, comedy club, and live music venue. The Plank House offers dining with a lovely water view. A buffet, cafe, lounge, and bakery are also on-site to satisfy your appetite. Concerts and special events are scheduled at The Mill Casino throughout the year. The largest mall along the Southern Oregon Coast, this shopping center houses major chain stores, locally-owned shops and galleries, and casual eateries. In addition to gift items crafted from the distinctive local myrtlewood, this touristy shop offers a variety of Oregon foods and souvenirs. Pick up a big colorful kite of your very own. Kite flying is a popular Oregon Coast activity.